Much of the recent discourse the history of Irish childhood has been concerned, often rightly so, with the experience of institutionalisation and other controversies that scarcely need repeating here. This has been at the expense, however, of the broader themes of children’s lives, what the editors of this landmark edited collection call ‘other childhoods’. Maria Luddy and James M. Smith firmly place the broad spectrum of Irish child-life front and centre of the historical discourse. With a strong emphasis on the role of culture in their lives and the cultural and literary representations of children, the book has a far broader appeal beyond the historian. The literary scholar, for example, will surely be interested in a lot that this work has to offer. To their credit the editors have not ignored the place of welfare, institutions and state failure in the lives of children but the very fact of devoting ‘less space’ to these issues reflects their view that there is of course far more to the Irish historical child. The book is divided into five sections and the following review will generally follow that structure. The child and history In her contribution on the early modern child O’Dowd sets herself three ambitious aims. Firstly, she compares attitudes to children in Ireland with those in Tudor and Stuart England. Secondly, she explores the differences in state attitudes to the education of children with a particular emphasis on gender difference. Finally, and naturally she progresses the analysis to the arrival of publicly funded institutions for children. The early twentieth century saw a growing state interest in the lives and welfare of children and Gillian McIntosh explores one aspect of this phenomenon through the prism of the well-being of young street traders. Daly considers the role of parents and their treatment by church and state with regard to the education of their children during the half century after independence. Charity, welfare and child care Crossman explores the practice of placing children in workhouses despite efforts by social reformers to end this phenomenon, particularly as the twentieth century took hold. In her chapter on the early years of the NSPCC in Ireland Luddy places particular emphasis on the role of the Dublin Aid Committee, a considerable challenge in light of the poor state of the archives in this regard. The relationship between the Irish state and child welfare has become the focus of particular attention and revision in recent decades. Eoin O’Sullivan emphasises the course of policy and legislation in this area from the mid-1960s to the 1980s. Robbie Gilligan delves into the world of the ‘public child’ where he again explores the role of the state but with an emphasis on the negative nature of the interventionist role of the latter. Shaping childhood cultures Ríona Nic Congáil explores the ideology of an indigenous educational movement known as the Irish Fireside Club. 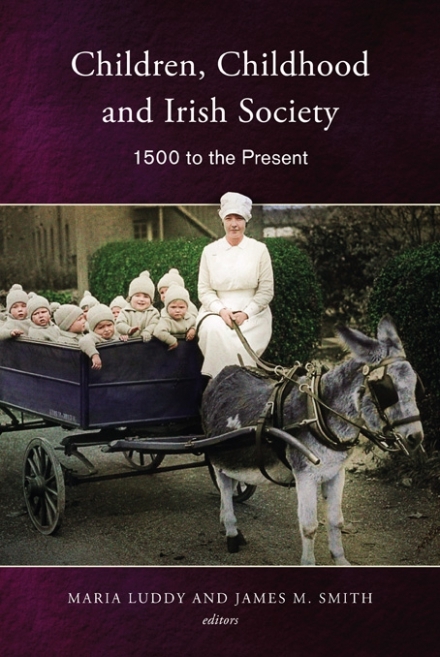 Her chapter is an example of how this volume moves away from some of the more obvious albeit significant themes of Irish childhood that have prevailed in historiography in recent times. In a laudable addition to the volume, Ciaran O’Neill set out to ‘rescue the Irish schoolboy novel from its relative obscurity’. In doing this he manages to shed a new light on the day-to-day learning experience of the young Irish male. The experience of Irish childhood as represented in literary autobiography comes under the spotlight in a detailed contribution from Claire Lynch. Máirín Nic Eoin continues the theme of autobiography in a chapter that principally deals with the interaction between the adult and the child and the importance of this relationship to the broader understanding of childhood. This section is rounded off by Barry Sloan who expertly identifies the role of boyhood in Irish life in the works of four significant writers, McGahern, O’Driscoll, Healy and Carson. Literary imaginings In an impressive opening to this section, Mary Shine Thompson considers the complexities of understanding early modern childhood. She seeks to achieve this by exploring the place of childhood in some of the writings of Jonathan Swift. One of the often-overlooked aspects of the work of Oscar Wilde has been his collections of fairy tales. Brandon Jernigan considers these works through the prism of what they reveal about the ‘ethical role for the Anglo-Irish in an Irish nationalist project’. Kate O’Brien’s The land of spices forms the basis for Eibhear Walshe’s discussion of female education in the new Irish state. The chapter makes early reference to the influence provided by O’Brien’s own alma mater, the noted Laurel Hill convent school in Limerick. The children’s fiction writer Patricia Lynch comes under the lens of scrutiny in a contribution from Leeann Lane. One of the core arguments of this chapter is that Lynch’s work was so strongly shaped by her own childhood experiences that her vision of Irish identity remained unchanged over four decades. Jane Elizabeth Dougherty rounds out the section by bringing the reader closer to the contemporary period than any other contributor. Her assessment of the presidency of Mary Robinson and the ‘Irish literary childhood’ challenges us to revise those eight years from an entirely new perspective. One of the central objectives of this volume was to ‘refocus the debate’ to encompass representations and experiences of childhood. To attempt a collection that embraces such an array of different themes and topics is highly ambitious and the skill of fusing these essays together into a coherent whole is surely a challenging one. Yet, this has been achieved in an impressive and well-structured publication that will serve as a core text opening new gateways and asking new questions on the history of Irish childhood for the current generation of scholars.